Hot dogs, sausage and brats are some of the least expensive grilling items we can think of. Standard cost of the most popular “dogs” are $0.10 per hot dog, less than $0.50 per sausage and brats can get up to around $0.75 each. Even with the cost of bun and condiment, it’s less than $1 per dog! That cost makes them one of the most frequently grilled items in America and can get pretty mundane after a while. 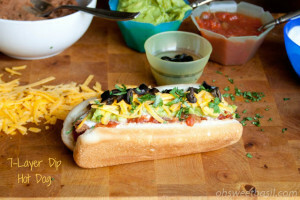 Here are some great tips on how to make your good hot dogs/sausages/brats even better! Tip Two: Make your own buns. We smoked our own bread for Grilled Cheese Sandwiches and it was delicious! Tip Four: Give it a style. We all know that favorite toppings vary by region. 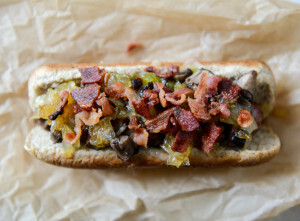 Whether you go for the standard New York Dog or the more inventive Seattle Dog, switching up the style of your hot dog, sausage or brat will give it a whole new flavor! Tip Five: Don’t box yourself in. We get into a slump and forget we can do all kinds of things with food! 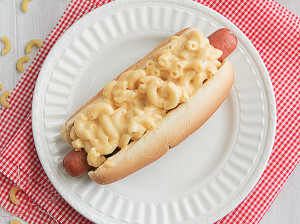 For example, if serving macaroni and cheese with hot dogs is a family favorite, why not make Macaroni and Cheese Hot Dogs? You could also substitute brats for the potato to make Loaded Baked Brats or change out sausage for the taco meat in burritos/tacos! What are some of your favorite ways to spice up your grilling recipes?